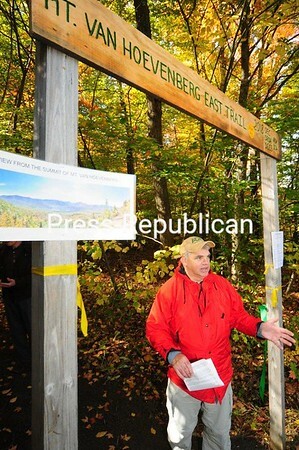 Adirondack Mountain Club Executive Director Neil Woodworth stands at the entrance to the new East Trail on Mount Van Hoevenberg in the Town of North Elba on Friday, when the newest trail in the Adirondacks was opened to the public just in time for Columbus Day weekend. Woodworth congratulated the State Department of Environmental Conservation for creating the hiking trail, while Assemblyman Dan Stec (R-Queensbury), who also attended the official opening, said that he will continue to campaign for the hiring of more badly needed DEC forest rangers. The 1.7-mile trail, which climbs 920 feet to its 2,940-foot summit, was designed and built to withstand heavier use, the DEC and Olympic Regional Development Authority said in a press release. Bench cuts send water across the path instead of down it, while heavy turnpike construction and tread hardening aim to combat erosion. And the route, DEC said, avoids extremely steep areas to make the hike less strenuous. The trailhead is at the Olympic Sports Complex at 220 Bobsled Run Road.